The amazing story of how Esperanto came to be. Starting at midnight on December 15, 2009, the Google logo was draped in a green flag. Perhaps you thought it was the Palestinian or the Saudi flag; perhaps this unsettled you enough to mouse it. If you did, you’d have learned that the flag celebrated the one hundred and fiftieth birthday of Ludwig Lazarus Zamenhof, the founder of Esperanto. And if you clicked on it, you’d have helped make “L.L. Zamenhof” the third most often-searched term on Google that day. None of this was happenstance. It was the work of an Israeli Esperantist named Yosi Shemer, who sends two hundred twenty-five people a weekly Jewish-joke-in-Esperanto (with all Hebrew or Yiddish terms glossed in Esperanto). Though he modestly credits the idea to “some European Esperantist,” it was Yosi who began the campaign last September, entreating Esperantists worldwide to lobby Google—in English—for a doodle. And enough of them did to conjure a bright green flag on Google’s homepage in 33 different languages, including Chinese, Japanese, and Korean. Google calls this a “global” doodle, and of the last 59 to appear on its various home pages, only Zamenhof, the invention of the bar code, and water on the moon received this honor. News travels fast in Esperanto-land and soon Esperantists who were already lifting glasses to honor Zamenhof, lifted them a bit higher. To Esperantists, the man who created the language-movement is a household god, a patron saint. As for non-Esperantists who are aware of Zamenhof, he’s too unthreatening nowadays to be derided as a quixotic dreamer. Most regard him with mild condescension as a MittelEuropean, Jewish Geppetto, hammering together his little toy language in the hope that it might someday become real. But inside this Geppetto was not only the dream of a new language, but also of something far stranger and unimagined: a new people altogether, and neither the Jews nor the Esperantists were the people he envisioned. Project by project, credo by credo, member by member, he tried to build a new people, a Geppetto with the audacity of Frankenstein. He was born in Bialystok, Poland (then, Greater Lithuania) in 1859, the son of the czar’s Jewish censor for Hebrew and Yiddish books. A slight, bespectacled man, Zamenhof had piercing, faintly Asiatic eyes that seemed out of place in his implausibly bulbous head. Nearing 30, his boxy beard still black, he could have passed for a younger, less self-important, brother of Sigmund Freud. He was an oculist by profession but, at one time or another, he’d been many other things: an early Zionist, a journalist, a modernizer of Yiddish, a general practitioner, a lecturer, a poet, a translator, a religious reformer, and an amateur language-engineer, with a knack for getting the bugs out. “I was taught,” he wrote, “that all men were brothers, and, meanwhile, in the street, in the square, everything at every step made me feel that men did not exist, only Russians, Poles, Germans, Jews and so on.” He was determined to bring “men” into being with his 1887 Lingvo Internacia, published under the pseudonym “Doctor Esperanto” (the hopeful one). At the back of the 44-page Russian-language pamphlet were coupons; the signatory was to promise to learn the international language provided ten million other people promised likewise. Two years later, Zamenhof had received only 1,000 promises. But by then the language, already going by his pseudonym, Esperanto, had been adopted by the “World Language Club” of Nuremberg, an Esperanto-language journal had been launched, and the introductory pamphlet—the Unua Libro (First Book)—had been translated into a dozen different languages. The rest, as they say, is history. From a mere 16 grammatical rules and 900-odd roots, Esperanto has endured, grown, and flourished into a living, world language with a sophisticated original literature. People make love and have toothaches in it; children are born into it. And it is alive and well on the Internet, where it is used to teach, inform, debate, entertain, gossip, persuade, and argue with other Esperantists about everything from advocacy to ... well, Zamenhof. He seemed to be the right man at the right time. Between 1866, when the transatlantic cable was finally up and running, and 1896, when Marconi patented the radio, the future promised new networks of communication about education, culture, science, and technology. Glimpsed just over the hills, the century that would beget the atom bomb appeared to have a distinctly human face, and it was speaking incessantly. With new conversations forging new bonds, relations among diverse peoples and nations were sure to benefit. Zamenhof intended Esperanto to jump-start such conversations. It was easy and cheap to learn–“the labor of a few hours,” as he put it—and equally accessible to workers and intellectuals. But though quick to be learned, it was slow to gain momentum and impotent to make money. The late 1890s found Zamenhof trying to start a medical career, raise a family, and secure his beloved language; he was itinerant and impoverished, at times despairing. By 1901, having staked his wife’s dowry, his family’s well-being, and his meager earnings on Esperanto, he became convinced that to survive, Esperanto would have to become the hereditary language of a people. Though the Hillelists of the future would be multicultural and multireligious, Zamenhof nonetheless imagined those Hillelists as a people. Thus he arrived at a conundrum. How could a group of human beings with varied national origins possibly attain—and sustain—the bonds of peoplehood? This is not a question that federated states—or multinationals such as the United Nations or the European Union—need to ponder. But those of us who are citizens of multicultural nations such as the United States, know that our “peoplehood” has a checkered history. Our knee-jerk, civics-class habit of equating American peoplehood with diversity is a recent development. In fact, attempts to define Americans as a “people” coincide with our most egregious episodes of racism, nativism, exclusionism, and anti-immigration legislation. But the Jews of the Russian empire spurned both of his gifts—Hillelism and Esperanto. As the Jewish Chronicle of London put it in 1907, “The sect which Dr. Zamenhof sought to establish has never been represented by more than one person—himself.” By the time Hilelismo appeared in 1901, the First Zionist Congress of 1897 had already convinced many Jews of Eastern Europe that a political solution to the Jewish question was close at hand. It is not that Zamenhof was out of step with developments; on the contrary, Hilelismo was a rebuke to political Zionism, and he was not the only Jew to write one. So did Ahad Haam, the religious conscience of the early Zionists, who derided Herzl for his “idolatrous” failure to root nationalism in Jewish ethics. As for the Jews and Esperanto, some were drawn to it from the start. In the earliest Esperanto adresaro (directory), there are nearly 200 Jewish names among the 900-odd Esperantists living under the Czar. But most Russian Jews, as Jeffrey Veidlinger has recently shown, were consumed with endless debates on the relative merits of Yiddish and Hebrew, and would continue to be for decades. Before the year was out, Zamenhof lightly revised the declaration, changing the name from Hillelismo to Homaranismo (Humanitarianism). He was de-Judaizing a movement grounded in Jewish ethics, presenting it anew to the Esperantists as a “philosophically pure monotheism.” But his intention to present Homaranismo at the Second World Congress in 1906 evidently met with a fierce backdraft from the movement’s leaders. In the months leading up to the Geneva congress, as Christer Kiselman has shown, Zamenhof began backpedaling on Homaranismo. It would have trouble gaining adherents, he wrote, if it required the adoption of a new language; if it were perceived as a religious dogma rather than a “neutral bridge” among religions; if it sounded too utopian. A mere three weeks before the opening of the Congress, his confidence low, he wrote to Javal, “According to your advice, I threw out of my congress speech the last part touching on Homaranismo—and speak only of the interna ideo—the internal idea—of Esperantism. I am leaving each person to clarify for himself the essence of the idea, as he wishes.” There is pathos in his concealment of Homaranismo at the behest of the movement’s most prestigious, mainly French, leaders; in this encoding of his most dearly held belief as the interna ideo. Pathos, but heroism too, since Zamenhof was in fact trusting the Esperantists themselves to understand the interna ideo as the mandate for a modern, ethical community. 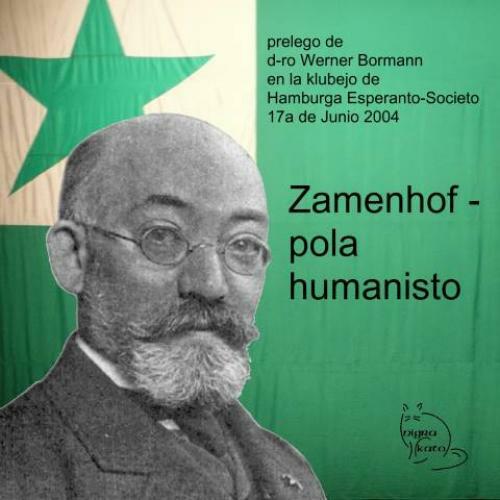 Zamenhof, though he many times renounced his authority over Esperanto, in fact wielded his authority shrewdly to guide the movement through three controversies, each of which eventually led to a schism—schisms, I would add, that the movement somehow survived. The first was the question of language reform. Since 1894, when the earliest agitation for language reform forced Zamenhof to hold a plebiscite, he realized that not only had the language failed to create a harmonious people; it was dividing its users. As Alexander Korjhenkov, Zamenhof’s most recent (and most scrupulous) biographer notes, the reforms Zamenhof proposed in 1894 reforms remain a puzzle. For one thing, they are far more extreme than his conservative fundamental rules would suggest; for another, he was at work translating Hamlet in the very language that he was now proposing to revise drastically. The reforms were defeated, but the problems remained, and Zamenhof turned his attention to setting up an elected, authorized Language Committee that would decide linguistic matters. In 1907 the issue of language reform, in Zamenhof’s words a “sword of Damocles,” nearly hacked the movement apart. When the prestigious pour l’adoption d’une langue auxiliare internationale met in Paris to select an authorized international language, Zamenhof’s hand-picked delegate sabotaged his, Zamenhof’s, sacred cause. Louis de Beaufront, the sham marquis annointed by Zamenhof, put forward an anonymously authored language called “Ido” (Esperanto for offspring), passing it off as a “revised” Esperanto. The “Ido schism” put paid to Zamenhof’s long-held expectation—both a dream and a fear—that an independent academy or international governmental authority would endorse Esperanto. Zamenhof stood up to the Delegation’s attempt to compel the Esperantists to accept “Ido” as their own; holding his ground, he declared the movement’s autonomy and the Language Committee’s authority over linguistic reform. To this day, Esperantists maintain that the Ido schism was the crucial coming-of-age for the movement, when it reckoned with—and proudly assumed—the burden of having an idealistic, ethical interna ideo. As the word “Anational” in the name of the socialist movement suggests, the controversial role played by national Esperanto groups also prompted a schism. A 1922 a compromise plan called the “Contract of Helsinki” set up an International Central Committee to balance the interests of national groups with those of the rank and file members of the Universal Esperanto Association. In the 1930s, national groups desiring greater control over the UEA broke away to form the Internacia Esperanto Ligo (International Esperanto League or IEL); in 1936, they abandoned the Geneva headquarters of the UEA and set up an Avignon papacy in London. Only after World War II, in 1947, were the two factions reunited. This story of quarrels and schisms is one way among others of telling the story of Zamenhof’s language-movement. My point in telling it this way—and in extending it 30 years after his death—is to marvel that Zamenhof kept faith, until almost the end of his life, with the Esperantists. For him, they remained the last, best chance of realizing his dream of creating an ethical, modern people. He knew that, in the mouths of free human beings, the language Esperanto could be used either for promoting harmony or for backbiting, cheating, and lying; he knew, in other words, that the language would never by itself confer on humanity the affective bonds of peoplehood. Only an Esperanto people who shared a language and an ethos could do that, and Zamenhof made it his life’s work to bring that people into being. In the end, it was not the Esperantists who caused him to lose his faith in this pursuit; it was a world at war. In 1917, a few months before his death, he sent yet another version Homaranismo to newspapers all over the world, asking this time that it be published in diverse national tongues. He knew that the people he’d tried to create, who would cherish their neutral, modern, classless language, pass it to their children, and share it universally, remained a dream. What Zamenhof could not know was that Esperanto would survive the brutal twentieth century because he inspired women and men in each generation to choose it freely—sometimes, during the century’s most brutal decades, at risk of their lives. It was the Esperantists after all, flawed, bickering, merely human, who would shadow forth the people of a more just, harmonious world. Esther Schor, a poet and professor of English at Princeton University, is the author of Emma Lazarus (Schocken, 2006) and is writing a book about Esperanto. Her essays and reviews have appeared in The Times Literary Supplement, The New York Times Book Review, and The Forward.